Hygiene is such a vital factor during food processing that it should be considered as one of the production process steps. Incorrect cleaning in the food industry can lead to the loss of an entire day’s production and directly affect the end product’s quality. 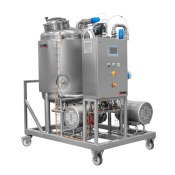 This is why, when thinking about small facilities that require a certain level of automation, INOXPA designed an automatic CIP system to help to clean plants, eliminate impurities, and reduce bacteria levels. 1 insulated 300L tank for preparing the cleaning solution. Electrical resistance heating with temperature regulation fitted in the tank. Constant level in the tank using a pressure switch. Collectors with automatic butterfly valves with pneumatic actuator and C-TOP+ control unit. Stainless steel electric panel. Comes with a 5.7” SIEMENS touchscreen and PLC using the SIEMENS S7-1200 CPU with programmes. Tested and verified in our installations. 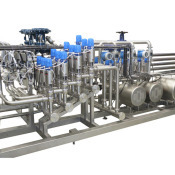 The pneumatic valves prevent errors during CIP operational phases such as rinsing with water, chemical product and its subsequent recovery, final rinsing. 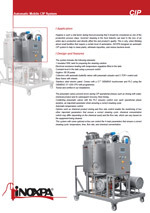 Combining pneumatic valves with the PLC ensures control over each operational phase duration, an important parameter when ensuring a correct cleaning cycle. 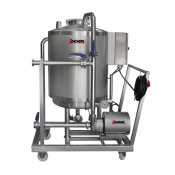 Options such as chemical product dosing and flow rate control enable the monitoring of two other important parameters that ensure a correct cleaning cycle: chemical concentration (which may differ depending on the chemical used) and the flow rate, which can vary based on the equipment being cleaned. This system with some optional extras can control the 4 main parameters that ensure a correct cleaning cycle: temperature, time, flow rate, and chemical concentration. 300 L AISI 304 tank for water recovery. In-line filter with a check valve and tubular sight glass. Detergent concentration dosing pump with a conductivity meter. Flow detector in the return line. CIP return pump ASPIR A-80, 3 kW. Flow rate control with an electronic flow meter and variable-frequency drive. Pressure gauge at the pump outlet.